According to Rehberg, who is a consumer programs coordinator for AEP Ohio, the producers of the show were doing a series about various locations in the United States and had heard about her dad’s innovative fishing technique and the large Vietnamese population in northwest Arkansas. The producers first approached Rehberg and her family last August. 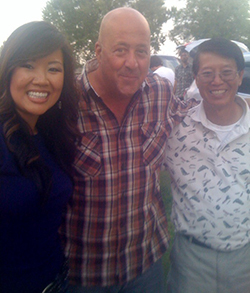 AEP Ohio’s Janet Rehberg (left) and her father, Thuan Phan (right), take advantage of a photo opportunity with Bizarre Foods’ Andrew Zimmern. Rehberg said her cousin — who works for the northwest Arkansas tourism board — had provided the show’s producers with a list of great places to visit in the area. It was her cousin’s description of his uncle’s unique fishing techniques and wonderful home cooking that caught the producers’ attention.